Aloe vera is a plant often touted for its medicinal benefits. You have probably heard of applying it to burns or wounds as a way to reduce pain and redness. However, for thousands of years, the aloe vera plant has been used for a variety of therapeutic and cosmetic purposes. There are dozens of reported uses for aloe vera, one of which is the relief of back pain. Even though historical evidence supports the use of aloe vera to relieve back pain, recent studies confirm that the anti-inflammatory, antioxidant and analgesic properties of the plant indeed provide an effective natural treatment. Why Is Aloe Vera Good for Back Pain? Vitamins: Aloe vera contains vitamins A, C, and E which are all antioxidants, as well as folic acid, choline and vitamin B12. Enzymes: There are eight different enzymes found in aloe vera including ones that reduce excessive inflammation and others that help break down sugars and fats. Minerals: Aloe vera has a variety of minerals, such as magnesium, calcium, potassium, zinc, chromium, copper, selenium, manganese and sodium. Some of these assist in the proper functioning of different metabolic pathways and others provide antioxidant effects. Fatty Acids: The fatty acids contained within aloe vera all help with inflammation, while lupeol specifically has analgesic and antiseptic properties. A polysaccharide called acemannan is only found in the aloe vera species of aloe plants and is believed to be responsible for much of the plant’s therapeutic benefits, such as the ability to promote a healthy inflammation response and the reduction of pain. Back pain can have a number of different causes — nerve pain, inflammation and even as a side effect of joint pain caused by arthritis. 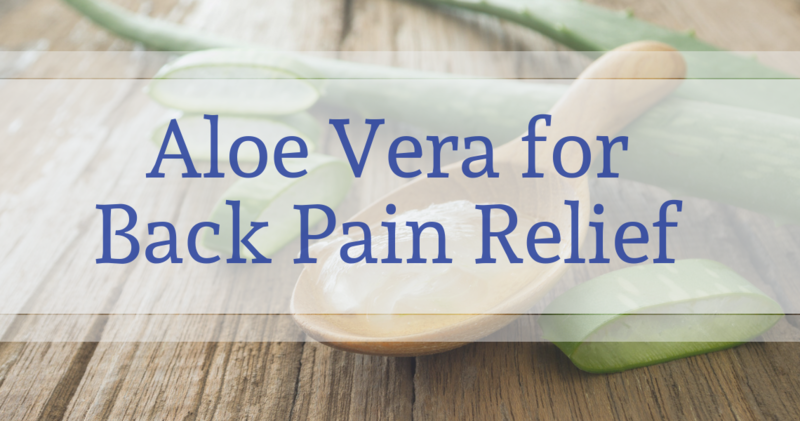 However, aloe vera has the potential to ease the pain associated with all different types of back issues. Oral use: Because of the nutrients and vitamins contained in aloe vera, its juice can be used to help treat inflammation. Just be sure you get aloe vera juice that is sugar-free so you can reap all its benefits. Topical use: If you’ve experienced back pain due to muscle strain, joint issues and nerve issues like sciatic nerve pain, then using aloe vera topically could be quite beneficial. Simply break open the plant’s leaves and massage the gel directly to the affected area. You can also purchase aloe vera-based topical creams. If you’ve experienced back pain that persists for longer than a few weeks, then it’s time to contact the caring team at International Spine Institute. We will get to know you one-on-one to find an effective treatment option that will relieve your back pain. We offer the least invasive surgical treatments that allow for faster recovery and cause less damage to the surrounding tissue than other procedures. If you’re ready to make an appointment, we invite you to contact us today.